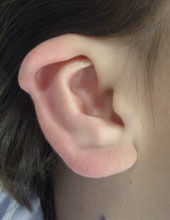 Cup ears are perhaps better termed ‘Constricted Ears’ but are also called ‘Lop Ears’ when the upper pole is folded over. In this condition the outer perimeter of the ear is not fully developed and the ear assumes a constricted or cup-like appearance. 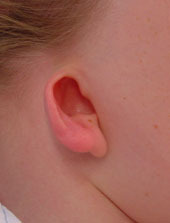 The condition ranges from variants of prominent ear to small poorly formed ears where the majority of the ear is missing. If the ear is almost fully formed but only the upper rim is hooded a small trim of the hooded portion will achieve the most natural results, sometimes leaving an ear that is slightly smaller than normal. 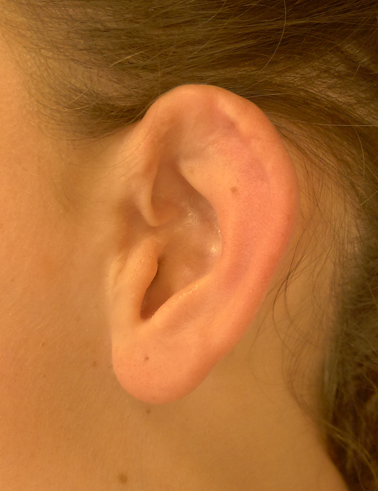 When the upper pole deficiency is mild to moderate the upper pole can be expanded with grafts from the bowl of the ear and local skin from behind the ear used to augment the anterior skin deficiency. 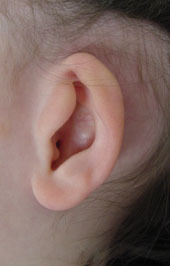 In more severe cases the ear is best treated as for Microtia with a cartilage framework spliced in to the lower pole. 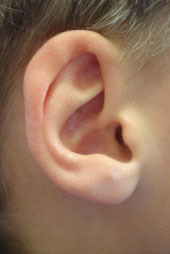 In some cases the ear may be low-set with a low hairline. A new ear should be made in the correct position using the remnant of the lobe if possible. In these cases the use of Cartilage grafts or Medpore with fascia and skin grafts may be necessary.